INDIANAPOLIS — August 10, 2017 — Imagine Products, Inc.®, publisher of applications for backing up, viewing, sharing, transcoding and archiving video assets, has released myLTO™ a new LTFS copy software. 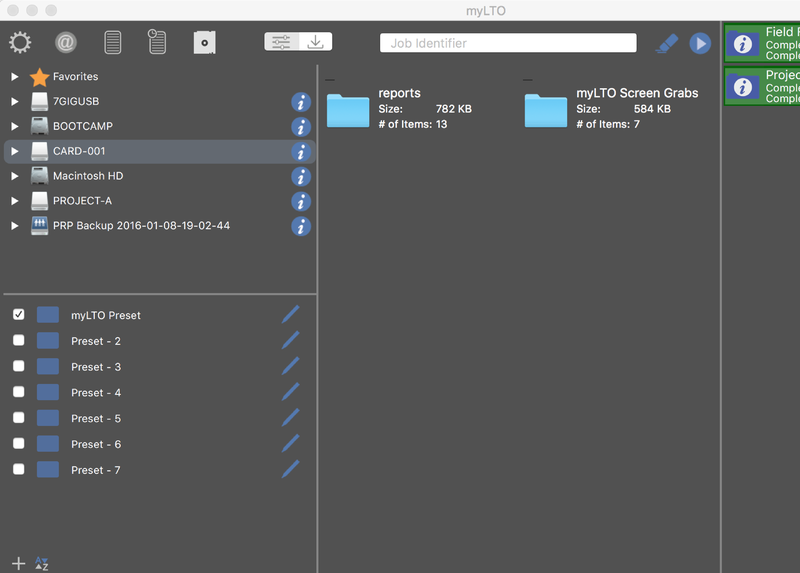 From the creators of ShotPut Pro 6, and with a similar user interface, myLTO formats and mounts tapes then seamlessly copies files to them. The application checks and corrects for LTFS data compliance and uses checksum technology for guaranteed accuracy. Based the knowledge and technology from PreRoll Post, Imagine’s widely used LTFS archive system, myLTO boasts the same speed and security users have come to expect from Imagine Products’ applications. myLTO allows users to mount, format and backup to one or more LTO tapes, or to hard drives, simultaneously. Like all applications from Imagine Products, files can be drag and dropped into the queue. Details about each file or volume like the size and number of files automatically populate. The LTFS application also boasts detailed reports that can be customized to user’sspecific needs. PDF reports, with thumbnails and metadata for all video files can be selected. CSV and TXT reports are also available. Similar to ShotPut Pro, naming presets can be set up in myLTO and color coded for quick reference and even shared with other myLTO users. Advanced naming options allow nest folders inside one another for better organization. In the Destination mode, files, folders and volumes can be dragged from the source column to the destination column into pre-existing folders. Switch the interface between light or dark motif to suit your workflow environment. In a boon for organizations with multiple seats of software, myLTO uses Imagine Products’ new account-based activation system, which has already proven successful in other Imagine Products applications. Applications can now be activated with either the email and password associated with the account the app was purchased, or single use serial numbers can be generated – these are particularly useful to rental houses or large post facilities. myLTO for Macintosh users is available for download now from www.imagineproducts.com and https://tinyurl.com/myLTOapp. The price is US $299.